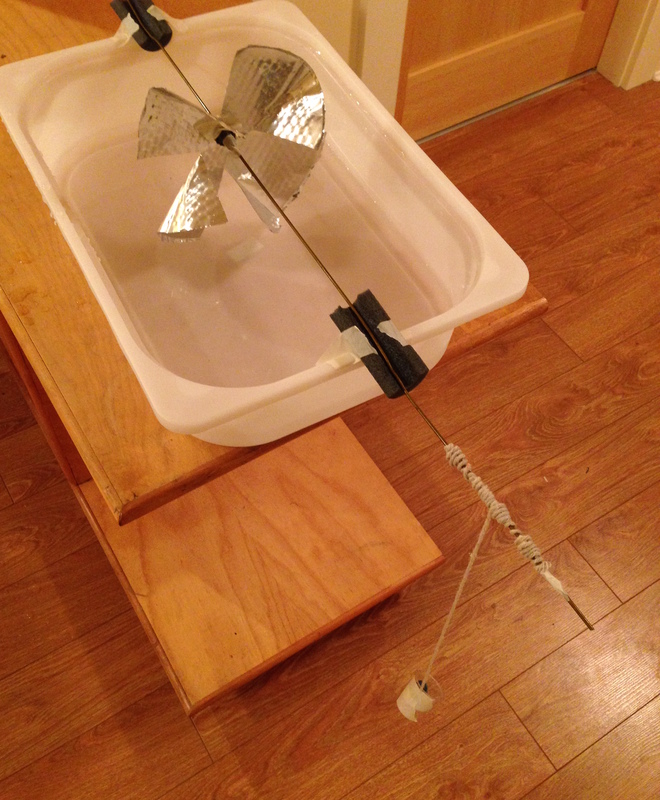 Make a wheel that can be turned by water to raise a marble. You have a challenge to lift a marble from the floor to the table top, without picking it up with your hands. You can only pour water, and the weight of the water will lift the marble. This activity uses a wheel. Tape U-shaped pieces of foam to the centre of the long sides of the tub. Fold a pie pan twice to find the centre, then punch a hole through with a pencil. Push a rod through the centre hole, then tape firmly to the pie pan with duct tape. Make cuts from the edge of the pie pan to within a pinky length of the centre in four places. Fold over the sides of each section to make a paddle wheel shape. Lay the wheel and axle (rod) over the foam supports on the tray. Test that it can turn without hitting the bottom of the tray. If necessary, fold over the outside edges of the pie plate - or alternatively, cut a smaller circle out of the pie pan to start with. Make sure one end of the rod protrudes over the edge of the tray more, then tape the string to this end of the rod. 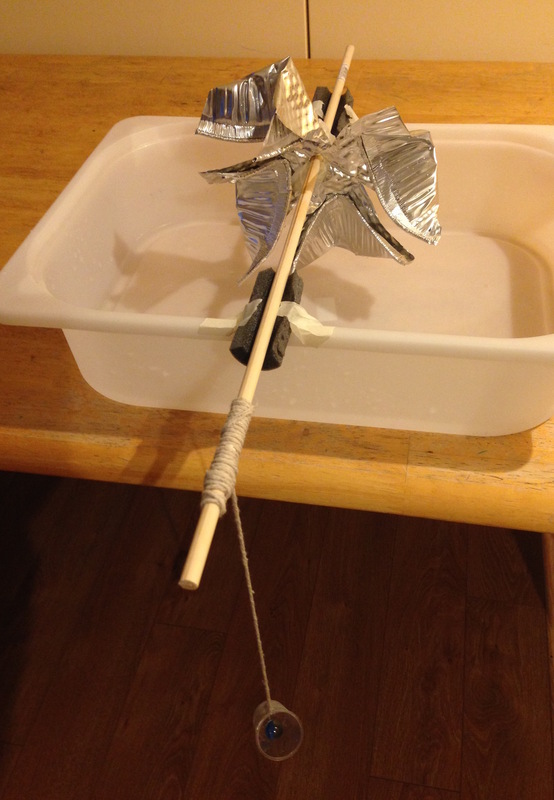 Cut the string off where it meets the floor, and use masking tape to secure a small pot to the end of the string. Add a marble to the cup. Students pour water onto the wheel to turn it, wrap the string around the rod, and raise the marble. The weight of the water hitting the paddle blades generates a force with makes the blades move and the wheel turn. The turning wheel turns the rod, which winds the string and pulls up the marble. Once the blades of the wheel start dipping in the water, the tray should be emptied (may need adult help) to pour the water back into the jug using the funnel for reuse. Students can be challenged to control how they pour the water to make the marble raise slowly or faster, or to raise more than one marble. Fish wheels are used to catch salmon during a run. The cut foil is SHARP. Need to use something else for the wheel if students are going to make their own, or tape the cut edges. Once the rod gets wet, the wheel cannot be attached to it anymore and the axle spins without turning the wheel - needs adapting also. Try this arrangement with a bucket (and pre-made dowel support).